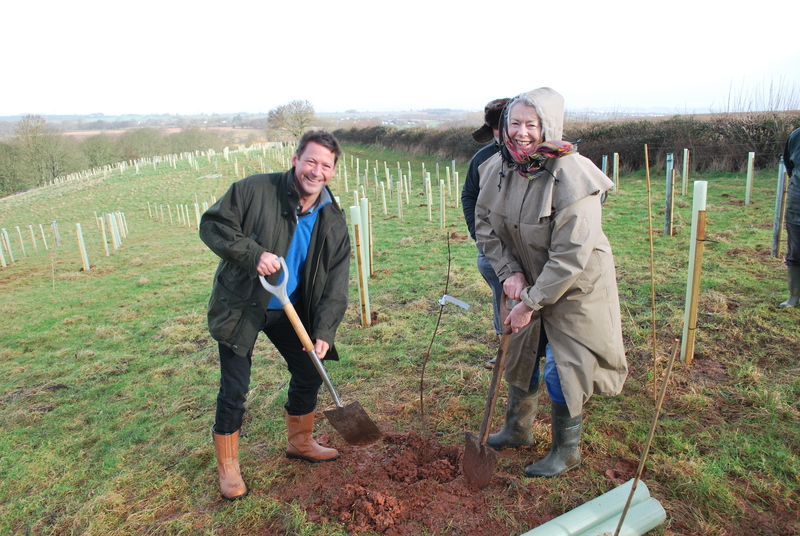 To commemorate the 25th anniversary of the Somerset Gardens Trust and it’s AGM at Halswell House the Chairman, Mrs Camilla Carter, and Edward Strachan jointly plant an Acer Trauvetteri near the site of Lady Tynte’s Summer House in Mill Wood. 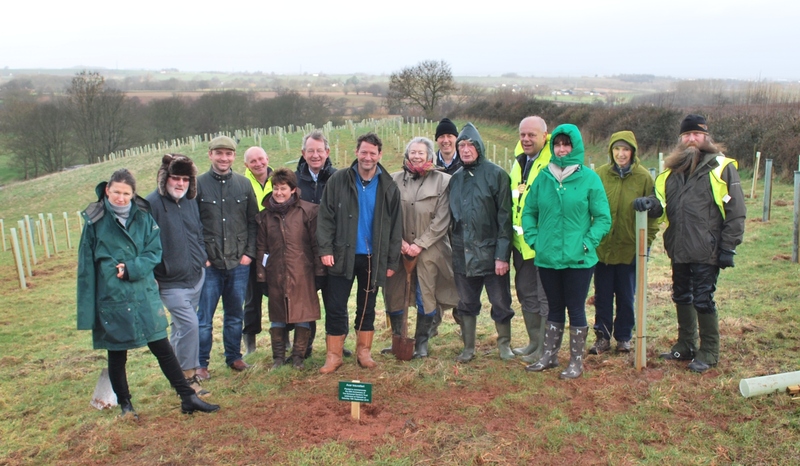 The group trundled up the hill in Mill Wood during what can only be described as ‘chilly’ conditions to examine the newly planted native trees and to add a finishing touch of their own. The choice of the summer house to plant this wonderful gift from the SGT is due to the belief that the building, long since vanished, was in the chinoiserie style and so the inclusion of a non-native tree is appropriate for this part of the wood. The recently commissioned archaeology has revealed that this summer house was about five meters deep with a curved front supported by pillars. As yet we have no images of the lost building but we live in hope that a watercolour or print might survive and surface one day, as so many other important records have done. We are grateful to Mrs Gill Durman for her recollection of the site in the 1950s and will be thrilled to hear from anyone who has any more information or memories of what once stood here! Some of the brave windswept enthusiasts. Inspecting the trimming of the laurels at the Grotto and Cold Bath. The Roman Bath-style grotto arches have had the full force of thick laurel roots burying into their structures so a careful removal of the worst offenders was needed to secure the structures. Laurel is believed to have always been the plant of choice around this area to give it a canopy of natural wild overgrowth appropriate to the rather pagan elements of the river source and the surrounding follies. 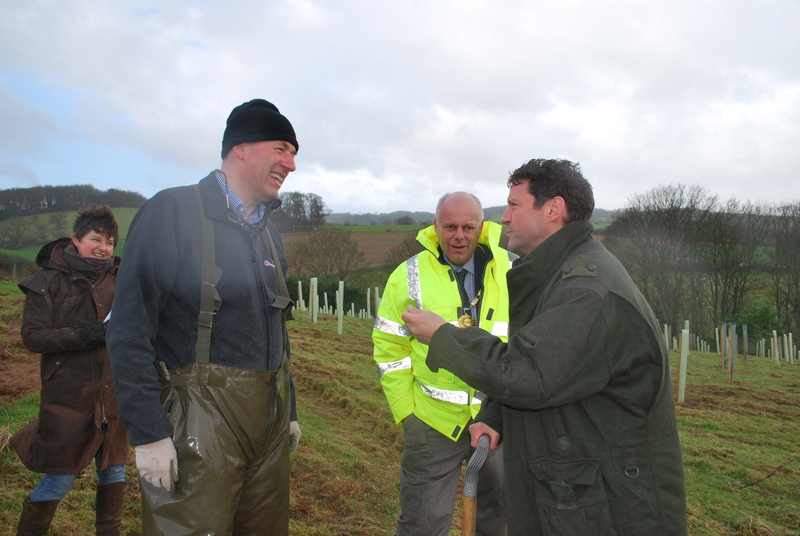 Simon Bonvoisin, braving the cold having graciously given up his coat for a lady, discusses the final phases of tree planting in Mill Wood with Edward Strachan. 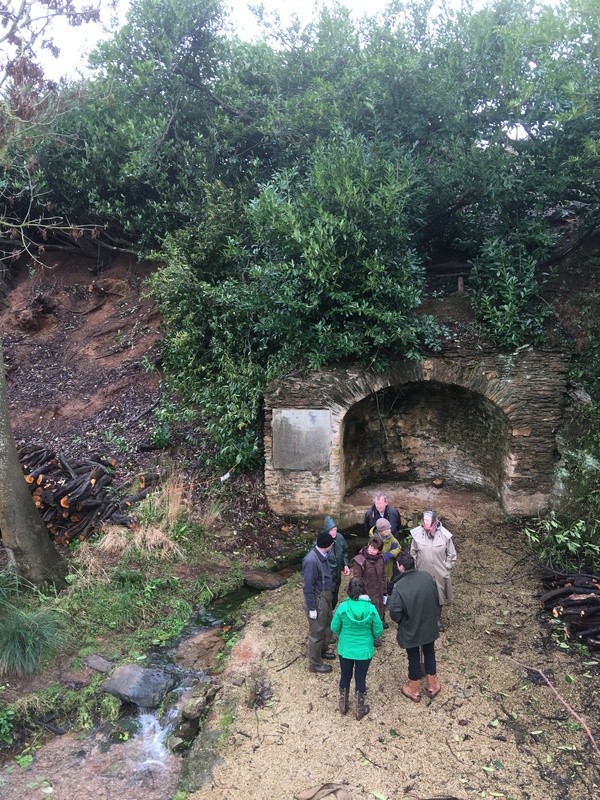 Some small areas have been left unplanted to leave room for archaeological work and rebuilding the missing follies and the necessary structural work that must be carried out on the dams and bridges.